(a) Location of the juxtaglomerular apparatus. (b) Enlargement of a section of the juxtaglomerular apparatus, which consists of the macula densa (darker yellow) and the juxtaglomerular cells. Black arrows indicate direction of blood flow. Blue arrows indicate flow of glomerular filtrate and tubular fluid. Near its origin, the distal convoluted tubule passes between the afferent and efferent arterioles and contacts them. At the point of contact, the epithelial cells of the distal convoluted tubule are quite tall and densely packed. These cells comprise a structure called the macula densa. Close by, in the wall of the afferent arteriole near its attachment to the glomerulus, are large, vascular smooth muscle cells called juxtaglomerular cells. Together with the cells of the macula densa, they constitute the juxtaglomerular apparatus (juks"tah-glo-mer'u-lar ap"ah-ra'tus) (complex). This structure is important in regulating the secretion of renin (see chapter 13, p. 528) (fig. 20.11). Most nephrons have corpuscles located in the renal cortex near the surface of the kidney. These cortical nephrons have relatively short nephron loops that usually do not reach the renal medulla. Another group, called juxtamedullary nephrons, have corpuscles close to the renal medulla, and their nephron loops extend deep into the medulla. Although these nephrons represent only about 20% of the total, they are important in regulating water balance (fig. 20.12). in a relatively high pressure in the glomerular capillaries compared to capillaries elsewhere. The efferent arteriole branches into a complex network of capillaries that surrounds the renal tubule called the peritubular capillary (per"i-tu'bu-lar kap' i-ler"e) system. Blood in the system has passed through two arterioles and is under relatively low pressure (see fig. 20.9). Branches of this system that primarily receive blood from the efferent arterioles of the juxtamedullary nephrons form capillary loops called vasa recta. These loops dip into the renal medulla and are closely associated with the loops of the juxtamedullary nephrons (fig. 20.13). After flowing through the vasa recta, blood returns to the renal cortex, where it joins blood from other branches of the peritubular capillary system and enters the venous system of the kidney. 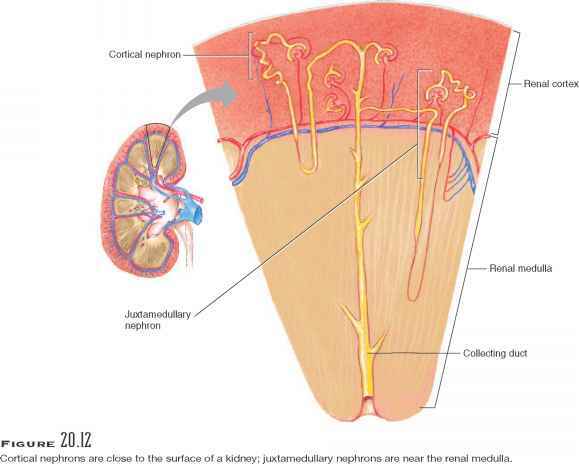 Figure 20.14 summarizes the pathway that blood follows as it passes through the blood vessels of the kidney and nephron. O Describe the system of vessels that supplies blood to the kidney. Name the parts of a nephron. 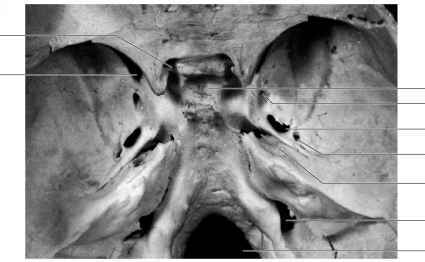 Which structures comprise the juxtaglomerular apparatus? Distinguish between a cortical nephron and a juxtamedullary nephron. Describe the blood supply of a nephron. The main function of the nephrons is to control the composition of body fluids and remove wastes from the blood. The product is urine, which is excreted from the body. It contains wastes and excess water and electrolytes. 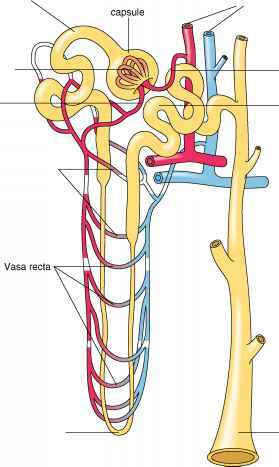 The capillary loop of the vasa recta is closely associated with the nephron loop of a juxtamedullary nephron.